He's one of music's most beloved icons. 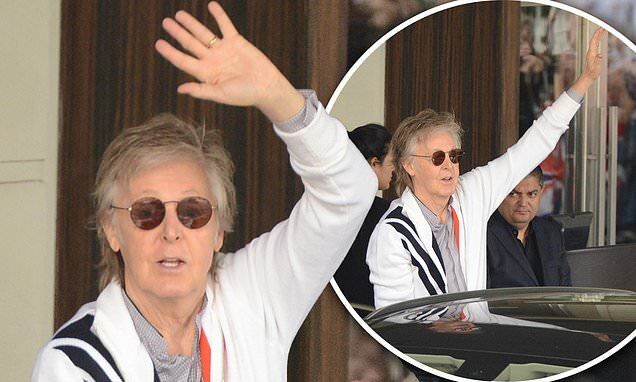 So it was no surprise that Sir Paul McCartney was greeted by crowds of fans as he came to the door of the Four Seasons hotel in Buenos Aires, Argentina on Saturday. The singer, 76, waved and blew kisses to fans who waited outside the hotel to catch a glimpse of him. Paul cut a casual figure, wearing a white jacket with a grey shirt and black trousers, completing his look with a pair of shades. The Beatles legend is currently on his Freshen Up tour, which began on September 17 in Canada and will conclude on July 13 at Dodger Stadium in Los Angeles. Despite selling more than 800 million records and winning 18 Grammys and an Oscar, Sir Paul said he'd finally 'made it' as he was honoured with a Gold Blue Peter Badge last month.